"Founded in 2015 by professional flat track/supermoto racer Johnny Lewis, Moto Anatomy - formerly known as 10 Training - was born with the idea that every motorcycle rider is unique, and must be treated so in order to reach their highest potential." We are unique in how we structure our yearly schedule. We offer programs from fall through the spring months at our private facility and then take the school on the road from Spring until Fall to offer training at remote locations across the U.S, Canada, and internationally. Moto Anatomy programs are custom fit – on and off the bike - to meet the student's riding goals. From beginners to professionals, there are multiple package options available anywhere from one-day to five-day programs that have smaller group sizes, often just 4 to 6 riders for all training programs at our facility, in order to provide a more personal, one-on-one approach with students. Schools on the road are generally kept to 10-15 students. Dates are added unexpectedly through the year so be sure to subscribe to our email list to make sure you catch those announcements. The main instructor for our school is American Flat Track National #10 & former Factory KTM Supermoto racer - Johnny Lewis. Read more about him here. We also bring in guest instructors from time to time which may include other pros or fast up-and-coming amateur riders that we think would greatly benefit from the experience themselves, but also have a skillset that would be beneficial to our students too. The Moto Anatomy facility is located in Center Hill, Florida. A hidden gem in the more rural area of Florida for racers, smack dab in between some of the most pristine private motocross facilities - including The Baker Factory, the Moto Sandbox, and Blake Baggett's personal facility El Chupacabra Ranch, which are all within just a few miles. Here we have access to multiple locations for various disciplines of riding: flat track (both short track & TT), motocross, supermoto, and off-road training. There are prime mountain bike trails and multiple cycling trails within a half hour. The facility is a work-in-progress and forever evolving, having just purchased our 16 acres of land in May of 2017 we have already built a mini-bike short track for training, are currently shaping out a clay 1/5th mile short track (which we hope to have done by the beginning of 2019), and we've purpose-built a motocross track specifically for training Currently for our general 4-day schools we do half of the training on-site and drive up to a 1/4 mile short track in Jasper, FL for the last 2-days, this may change as the property evolves. We have plans to build an enduro area as well to give students the chance to experience life on a motorcycle over obstacles. We generally house many of the students during their stay, as we have an 8'x20' bunkhouse (a converted shipping container house) that accommodates 2-4 people. We are currently building a pole barn house/garage and the current converted shipping container house that we live in will then become a guest house for students as well in the near future. We have 4 RV hook-ups and water/sewer as well as tons of space for camping. There are also hotel locations in the area. We are just five miles off I-75 with five airports an hour and a half away. Booking tip *Allegiant is a very low cost airline that we use regularly and they fly into Orlando Sanford and Tampa/St.Petersburg airport. Their airport locations are limited so check their flight map on their website to see if there's an option near you! Both Orlando & Tampa International have very low cost flights at most times of the year as well. We provide full meals for all students at all schools at our facility unless otherwise noted, prepared by my wife Alysha. We believe this frees up your energy worrying about meals when you're coming here to have an awesome time riding and relaxing in between. We are a plant-based family and believe in a diet abundant in fruits and vegetables. We love the experience of sitting around a table enjoying amazing nourishing food and indulging in meaningful conversation with our students at meal-time. When you're here, you're family. Although Johnny Lewis’ roots are flat track and supermoto racing, the 28 year old native of Coatesville, Pennsylvania has a background in multiple disciplines as well, including road racing and off-road. Lewis went pro at 16 years old in AMA Supermoto, riding for the Factory KTM team. The youngster showed great potential as one of the sports rising stars and eventually earned his first win in the Unlimited Class at Nashville. Lewis switched gears in 2009 and returned to his flat track roots in the American Flat Track series. He captured his first Dash for Cash win in 2010 followed by 3 career podiums in 2011 and his first National win at the Daytona short track in 2012. Lewis has raced a part-time effort with multiple teams over the past 6 years assisting the development of multiple brands, including the Ducati & KTM. Other career highlights of Lewis are being named AMA Sports Athlete of the Year in 2004 for flat track and being invited to compete in multiple international supermoto events such as the prestigious Superbikers event in Mettet, Belgium as well as being chosen as 1 of 3 riders to represent the USA at the Supermoto of Nations in Italy in 2014. 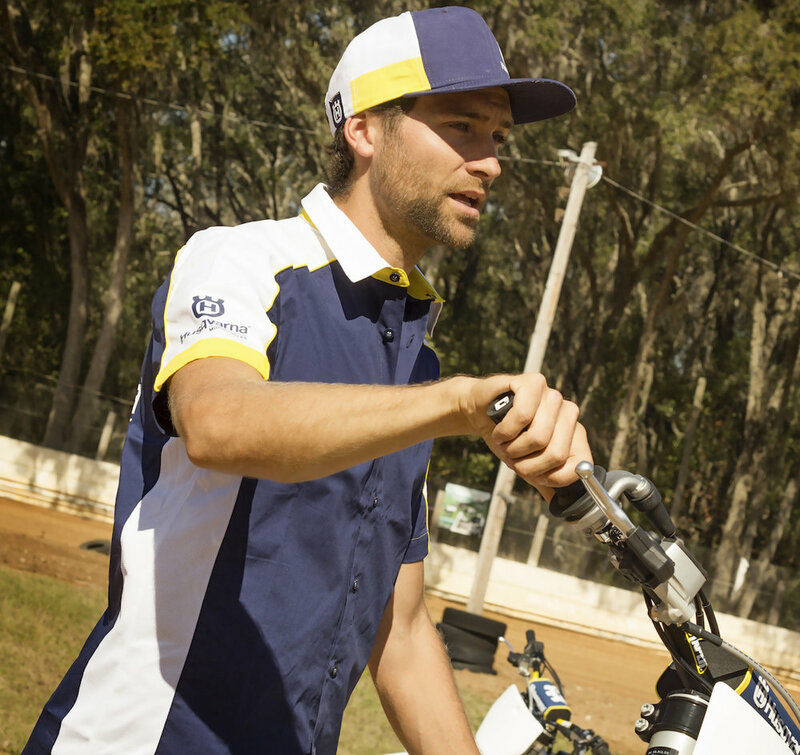 Lewis has also been invited to compete in the X Games 4 times, both in Supermoto and Flat Track, with a 4th place finish in X Games Flat Track 2015 just one position shy of an X Games medal. Lewis currently resides in Center Hill, FL with his wife Alysha and their two young children Maxsen and Clary.